Manufacturing and industry are basic cornerstones of modern society. They help us enjoying life in a better way and also we can hope for a better future. We must keep in mind that these would not have been possible with the tools and equipment to do so. Industrial fabrication would cease to exist if welding is not there. Let’s take a closer look at it. Welding companies from Gold Coast are on the rise today because of the ever increasing need for good, solid work. Those with the knowhow and expertise continue to grow and flourish while lesser companies often bite the dust. Sheet metal fabrication is also an important part of our daily lives. A lot of objects that we use on a daily basis are a result of this technique. 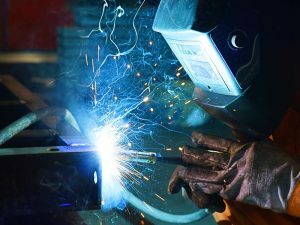 Welding is the means by which two materials are securely joined, by using the coalescence property and the help of any filler material. Heat as well as energy, is generated during welding and they are used to liquefy the metals at the place of joining. After the joint has been allowed to cool, a secure joint is established. Generally, thermoplastics and metals are used as welding materials. Because of differing requirements of the industry and materials used, there are different types of welding developed. All of them have their pros and cons. Let us take a look at them. The stick is the electrode, coated with protecting flux. The electrode holder can hold the stick in its position, while the electric arc can be generated by either alternating or direct current. The electrode melts slowly, including the metals at the join. Gas vapour is released by flux coating and a shielded environment is created. This uses an electrode of tungsten to produce weld. The area of the weld is protected by inert gases like helium and argon. TIG means Tungsten Inert Gas. This process uses a consumable electrode, and it is fed automatically. A blanket of grainy fusible flux is used, made up of many compounds namely calcium fluoride, silica and lime. Manganese oxide is also used in the flux. The welding area is thus “submerged” by the granular flux. What Should You Do During Motorcycle Breakdown?